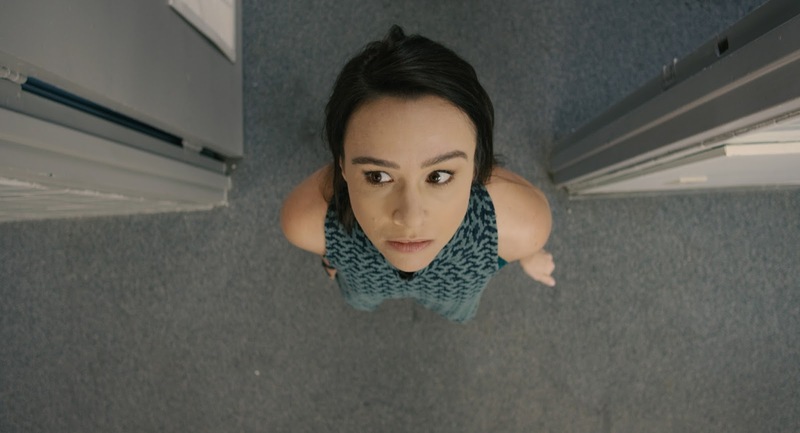 Director and co-writer Christopher Lawrence Chapman's Inoperable falls into the type of horror film that I really enjoy; that of a character stuck in some sort of nightmarish time loop. While this isn't without its faults there is still enough good here to make for a film that not only makes you think but is an enjoyable ride too. Sometimes it is good not to be given all the answers and Inoperable is a good example. The mystery of just what is going on was firmly in the front of my mind throughout this. It was only a couple of months back we had Happy Death Day that had a similar concept of a trapped character repeating time but this is very different in feel. For one the budget is a lot less, the majority of the movie takes place in long empty hospital corridors. Another reason is that the main character isn't the only one trapped in a loop, there is a bit of a Cube 2: Hypercube vibe in that sometimes Amy will find versions of Ryan or Jen that have gone insane due to the amount of times they have repeated the same time period with Ryan saying at one point that they had been trapped there for four years. At other points she will find versions of the characters who have never met her before. With Amy repeatedly finding herself back in her car stuck in traffic, and recurring foot injuries and nose bleeds it seemed pretty clear to me what was going on; that she was in some sort of purgatory after a car accident. Whether that is the case or not there was evidence pointing that way only for events to be turned on their head a bit towards the finale. This is where Inoperable slightly unravelled for me as it didn't quite match up with what was being shown, though did have some clever moments that I loved (such as the bit with the magazine). I was impressed with the directing on many an occasion here, such as when Amy is in her car and the camera turns on its side before transitioning to her laying in a bed. There was also a great moment that had her seeming to float down a corridor, I love that effect, while later on the camera work seemed inspired by Sam Raimi and had a camera that swooped after the characters as they went down a hallway. Throughout the inventive use of the camera constantly delighted. It is fitting that I watched this during Woman in Horror month as Danielle Harris of course starred in a couple of the Halloween films, Halloween 4 is probably in my top 20 horror films of all time so it was neat to see her playing an adult role. The acting for most of the cast is good enough, I found a few of the hospital staff to be a bit weak but overall there wasn't anyone who stuck out as really bad. I didn't like the fact that characters kept seeming to be flipping moods in between scene breaks. As an example we have Amy all upset, then the scene changes and suddenly she seems fine and it is Jen who is the one getting upset, I never like it when that sort of continuity blemish happens. Harris was good in her role here, though I think it falls to Denton as my favourite actor here, even if he is the character charged with having to sell a unique but barmy sounding explanation for the time loop to Amy. Something to do with a super hurricane interrupting a particle test at a mysterious nearby science facility: as I said kinda out there! Aside from the horror of being trapped in a loop that is shrinking each time it repeats the main body of fear comes from the staff who are nearly always voiceless and give chase to the main leads upon sight, though often will march purposefully rather than outright sprint. This leads to Amy's group constantly getting abducted and tortured by the doctors and nurses who seem intent on performing needless and violent surgeries on everyone under their care. The most supernatural element comes with a patient from the psychiatric ward who seems inexorably linked with the whole situation and keeps appearing and disappearing without a trace. I was impressed with the special effects in particular here, there are some nice scalpel on flesh moments, and when a character steps on a load of broken glass my skin went cold! I enjoyed the mystery of Inoperable and while I don't really like the eventual reveal of just what is likely going on (despite some stand out moments like the final shot, the comic book style end credits, and that magazine moment) I felt that it still stood up as an enjoyable head scratcher. The main trio of actors all gave good performances, while the camera work and special effects added to the insanity here. It may be lacking polish in certain areas but regardless this is worth a watch. Inoperable came out today, it is available on DVD, Cable VOD and Digital HD.